Mark Wilson of Co.Design is more or less a vegetarian now, and so when I wanted yet another curry-inspired recipe for the Instant Pot I turned to him. The original one uses amchoor, a dried unripe mango powder used in Punjabi cooking to provide sourness. I didn’t want to buy yet another spice to add to my pantry, so I found the greenest mango I could find and cut off two generous cheeks from it and finely chopped it. The key is sourness, not bitterness, so make sure there is no peel involved. 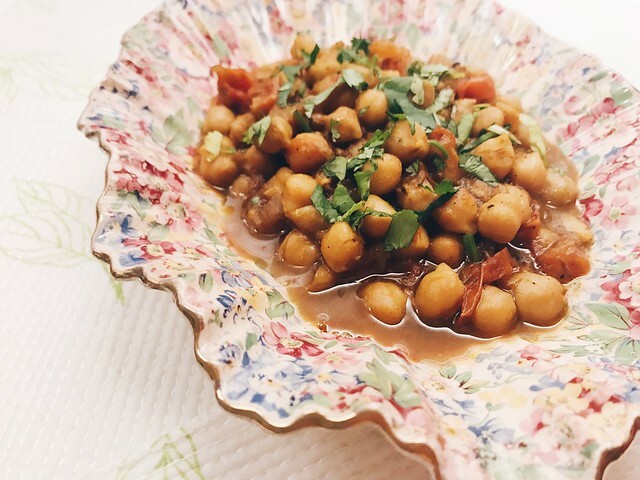 If you don’t have time to soak chickpeas overnight, you may use chickpeas in a can; just make sure you rinse and drain them well. 1. Using the sauté function of your Instant Pot, heat some oil. Add the onion and bay leaf and stir-fry for about 5 minutes. Add the garlic and ginger, stir, then add the chopped tomatoes and mango and cook until the tomatoes break down. Add the spices and stir. 2. Add the chickpeas and about 2 cups of water. Cover and lock the lid properly. Select the Pressure Cook function for 35 minutes. When it’s done, do a quick release after venting and letting the steam out. 3. Discard the cardamom and the bay leaves. Serve in a bowl and garnish with chopped cilantro.